The Australian Disputes Centre’s (ADC) Schools Invitational Debating Competition offers Year 10 students a unique opportunity on Sydney’s debating calendar. Debating teaches students how to find their voice, communicate their thoughts and ideas as a public speaker, how to think on their feet and how to construct a persuasive argument. The competition creates a unique opportunity for students to build relationships with their peers across Sydney. Drawing students from a range of schools, students meet and debate over six consecutive weeks in teams made up of debaters from different schools. Students learn about team work, building a network and developing friendships with people they may not ordinarily have the chance to meet. The ADC debating competition is an important opportunity for students, who have limited or no previous experience of debating, to benefit from specialist coaching. Students develop their debating skills with the support of their teachers in attendance and under the guidance of experienced University Debaters and lawyers providing the adjudication and coaching on a pro-bono basis. The political party that is the Commonwealth Government should not be able to replace its leader, and thus the Prime Minister, without calling a general election. Court proceedings should be live streamed on the internet for the benefit of the public and students. Maanya Maini and Julia Santos were in the Grand Final Team with Maanya Maini being awarded the Best Debater for the entire competition. Julia Santos was recognised for her teamwork and collegiality. This is a tremendous result for Maanya, Julia and all the students involved in the competition. At Loreto Normanhurst, we encourage every student to be as active and willing to participate in the extra-curricular life of the school. Please encourage your daughter to have a go at things such as debating and the various offerings the school has, as she will make many friends and develop life-long skills that will equip her well for her future. Student Services has a high volume of items in its lost property including blazers, jumpers, hats, drink bottles and other sundry items. We ask that families do an audit of their daughter’s uniform and ask her to come to Student Services to collect items that are missing. Any items not collected by the end of Week 1 of Term 4 will be donated to the Uniform Shop. The SAN College of Education is offering a First Aid course to Year 12 girls. This course was run last year and the girls who attended found it very beneficial prior to heading to their respective schoolies trips. 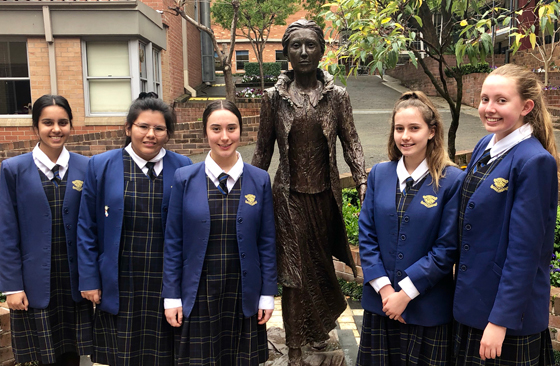 As this is the last Pastoral Newsletter for Term 3, I take this time to wish you, your daughters and families a restful spring break and I look forward to seeing the girls back on Monday 15 October in their full summer uniform. Please do not hesitate to contact me here if you have any questions or concerns about your daughter.